I need a 2x4 red plate and one of those blue thingies. Blogging about my favourite toy over on the craft blog. It's totally valid. Lego is a medium for art. Brickvention - Melbourne - this Sunday. See you there! Fawn and Forest have some terrific looking toys, along with all the essentials for today's modern interior. This gloggomobil is entirely handcrafted in Switzerland (which accounts for the $899 price tag), but there are more affordable choices, such as the cattiest cat toy in existence. 50 today! Who doesn't love Lego? Not possible. I do believe I might turn this into a Lego appreciation blog for the rest of the week. The photo here shows about 50% of the regular Lego in our family collection* spread out on the floor. I've been assembling all the models recently in kind of a nostalgic summer activity. Fortunately my brother very cleverly kept all the instructions in a display book. We have a whole bunch of Technic too, but that can wait a bit I think. It's really hard to assemble models when all the pieces are mixed together, it's taking forever. That little house at the back is a freeform (duh), the plane has crash landed due to a lack of a windscreen and the bulldozer is bravely attempting to clean up. 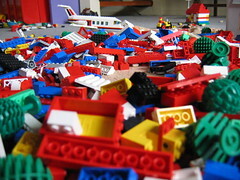 Lego Tip of the Day - Dump your collection onto a sheet or play mat when you begin. Finding pieces becomes much easier and faster. To pack up, collect the corners of the sheet into a sack and tip the pieces back into the box in one smooth move. Easy peasy. *You can't really own Lego - you share it. With me.